If you’ve ever been working in a document only to have the program unexpectedly close, then you know the panic that often ensues upon such an event. Imagine, however, that you not only lose one document, but every file, photo and document you’ve ever saved on your computer. I have, and I can tell you that the panic and dismay that accompanies it isn’t fun, especially if you’re working on a deadline. Unfortunately, your data is extremely vulnerable to all sorts of threats, which can hit in an instant, usually at the most inconvenient times. Most people don’t think these things will happen to them, so when they do, they’re often unprepared, which comes at a high price. Here are some of the costs of not backing up your data, once you read them you will understand why you need a folder lock. If you’re working on an important document or store various important documents on your computer, chances are it’s going to cost you if you lose them. Whether it’s important financial documents you’d have to have someone redo, or important files for work, not backing up your data could mean major losses. Think of all the time and effort you put into some of those files and what it would mean if you couldn’t get them back. If you’re in the process of finalizing a document for an important client or your boss, losing your data could mean missing a deadline, and therefore, losing a client or suffering consequences at work. Unfortunately, in this day and age, not backing up your data isn’t a great excuse. Most people expect you to. Furthermore, if you work in a field where building a portfolio helps you when you’re on the look-out for new clients, a loss of data can mean a loss of your portfolio, ultimately costing you potential new clients as you attempt to rebuild the samples your portfolio once had. Sometimes you get lucky and your files aren’t completely lost – you just might be able to recover them. However, it should be said that recovering lost files is no easy feat and it’s not something that can usually be done quickly. Even for skilled tech workers, recovering lost data isn’t always a straightforward process, and can sometimes take days. During that time, you’re likely going to need a file you don’t have access to and quite possibly miss opportunities because you’re unable to access various things. Furthermore, if you keep important things like a list of your passwords on your computer, you could face a bigger inconvenience. Unless you remember every password you’ve ever created, you’ll have to go through the painstaking process of creating new ones for every account you have. Time and productivity are money, and being forced to stop your work and projects because you’ve lost your data inherently means you’re going to lose money. If your computer collapses or gets infected by a virus, you’ll have to have a tech company or business assist you in the recovery of your files. As I mentioned earlier, this is no quick process, which means you’ll be without a computer and all important information for at least a few days. During that time, anything you were working on will ultimately come to a standstill, which means you’ll lose valuable work time. Whether you’re working on projects that need to be completed or just communicating through email with clients and business associates (yes you can do this on other devices, but it’s often more time consuming and less convenient), not having access to your computer hinders your ability to be productive. Furthermore, if a project or document requires you to use or refer back to an older project or document, you may have to start from scratch if you’re unable to access those previous files. Therefore, you lose valuable time restarting a project and essentially working on two different tasks, whereas before, you would have only had one to work on. Moreover, depending on the materials you need to create various projects, it’ll take time to reacquire all of those as well. 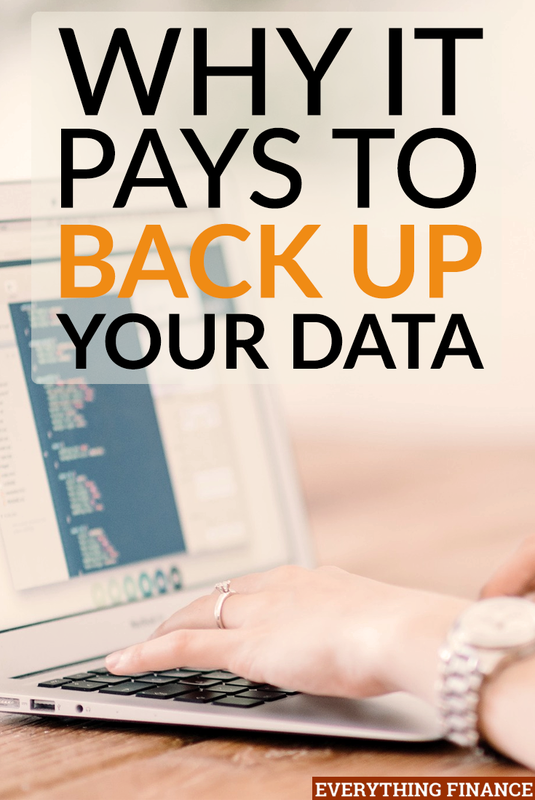 Not backing up your electronic data can cost you actual dollars in many ways. For starters, if you have any hope of recovering your files, you’ll have to enlist the help of tech support, unless you’re a tech wiz yourself, in which case you probably aren’t in this mess. Unfortunately, tech support doesn’t come cheap, and depending on how long your computer takes to fix, it can cost you a lot. Furthermore, as I mentioned earlier, if you can’t recover all the files and materials you once had, you’ll probably need to get them back one way or another. If you previously purchased digital materials, you might have a hard time tracking them down again. While you’ll have to spend a little money to purchase an external hard drive to back your files up with, it’s nothing compared to the cost of skipping this important task. Your computer and your data are constantly susceptible to numerous viruses and threats, and in terms of your hard drive, it has a finite amount of time before going bad itself. You can lose everything in a second, and those moments don’t often come with any warning, which means you should always be prepared. After all, depending on the hit your computer takes, you may have to invest in a new device all together. It’s bad enough to have to buy a new computer, let alone to lose all your valuable personal and business files as well. Do you back up your files? If so, how often do you take the time to back up your data? What tools do you use? Have you ever lost your files?